Traders at the New York Stock Exchange on Friday. The Dow Jones industrial average fell 666 points amid signs that interest rates are heading higher. But worries about inflation grew when the report showed that average hourly wages grew 2.9 percent from a year ago — the largest increase since June 2009. Yields for 10-year Treasurys hit four-year highs Friday. All this sets the stage for the Federal Reserve to continue raising interest rates, with the next hike expected in March. That would make credit cards, car loans and mortgages more expensive. The Dow closed at 25,520.96, and Friday's 666-point drop was the sixth-worst ever. The index is still up more than 3 percent since the year began. But with a loss of about more than 1,000 points since Monday, it was the blue chip index's worst weekly performance in two years. 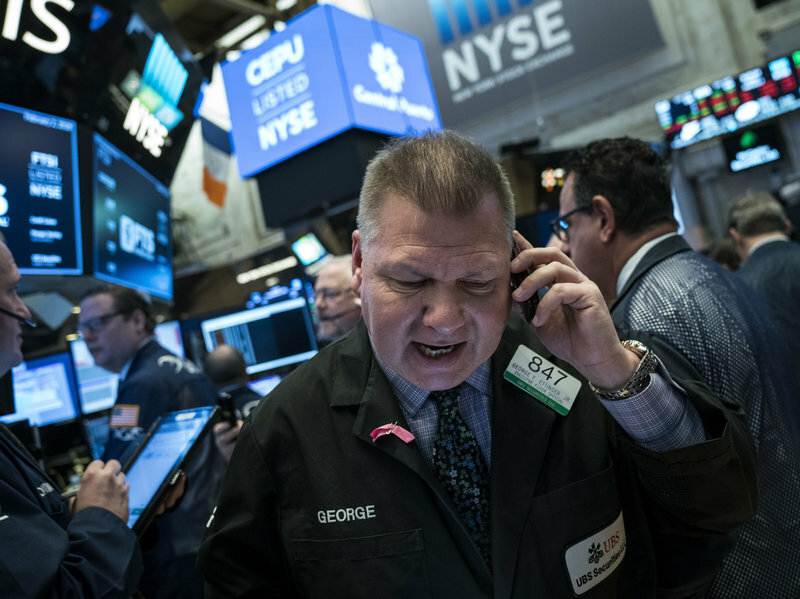 Among the stocks in the Dow, Apple fell 4.3 percent Friday, Exxon Mobil lost 5.1 percent, Chevron was down nearly 6 percent and Goldman Sachs dropped 4.5 percent. Other major stock indexes fell about 2 percent Friday. The broader S&P 500 slid 60 points, to 2,762.13; the Nasdaq index lost 145 points, closing at 7,240.95. Carl Tannenbaum, chief economist at Northern Trust, says Friday's employment report shows the economy continues to have a lot of energy. The higher wage growth and potentially higher inflation "might then lead the Federal Reserve to raise their interest rates more rapidly than the market is comfortable with," he told NPR's John Ydstie. NPR's Jim Zarroli reports that the wage gains have investors wondering "are we going too fast? Are we going to see more inflation? ... Then you have these big tax cuts taking effect, which means people could be spending more. The government's going to have to borrow more — what's that going to mean?" But, he says, "The stock market was really due to come down anyway. We have these corrections. They're normal. You can't have stocks rising at these levels all the time." 0 Response to "Dow Drops 666 Points In Sharp Sell-Off"